Superintendent Michelle King and board President Steve Zimmer at Tuesday’s meeting. 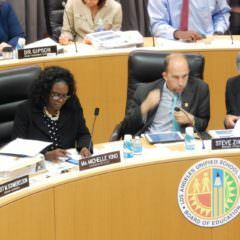 The LA Unified school board on Tuesday unanimously approved a $7.6 billion balanced budget for 2016-17, with some of the most passionate objections devoted to the 14 percent increase for school police. The passing of the budget became much simpler after the state notified the board last week that it would have an extra year to sort out an issue over the district’s spending of state funds designated for students who are in the foster care system, low-income or English language learners. Before the notification from the state, the district had expected it would have had to change its funding for high-needs students and spend an additional $245 million, which could have resulted in the loss of 2,000 teacher and administrator jobs by next spring and increased class sizes. The board found out last week it would have one year to work with the state. District officials disputed the state’s findings from the beginning and still plan to appeal the decision. While this year’s budget — a $700 million increase over last year — was balanced, the district faces continued declining enrollment and increasing costs in retirement benefits. Next year, the district expects a decline of 13,728 traditional and affiliated charter students, while independent charter enrollment will increase by 5,984. The district’s financial experts predict that next year’s budget will also be balanced, but a deficit is forecast for the 2018-19 budget year. In crafting the budget, Superintendent Michelle King said her staff listened to comments from the community, as required under the new state funding formula, about what programs they would like to receive funding. “Are we there? No, we’re not there, but we are on a path moving forward in the right direction,” King said. Some public speakers who addressed the board Tuesday called for more funding for restorative justice, the district’s new approach to discipline, and less funding for school police officers. “We believe this increase is wholly out of line from what this district intends to do to improve school climate,” she added. • Related story: Data show 3 of the 5 biggest school districts hire more security officers than counselors. Laura Aguilar, who graduated last year from Manual Arts High School, also called for reducing the school police budget. The LA School Police Department’s budget will increase $8 million, or 14 percent, to $67 million. The district’s finance mavens explained that was due to increases in salary, healthcare benefits and pension payments. The increase in the school police department’s last year was $1.5 million. King said the district has not increased staffing in its police department even as it opened 130 schools. Board members pointed out that the restorative justice program received a $7 million boost in next year’s budget to $10.8 million. School board member Ref Rodriguez said he would like to see a “decline in the way that some of our schools are being staffed by police” as the district shifts toward fully implementing restorative justice practices. Board member Monica Ratliff pointed out that she hears from parents in her east San Fernando Valley district that they would like more school police officers on campuses, even on elementary school campuses. Most board members praised King’s budget, her first as superintendent. “In general, I think that your staff and you have done a good job of trying to meet the needs in the district with the limited funds we have,” Ratliff said. “This is a budget that represents hard work, that represents a long fight for both equity and advocacy. It’s not yet an aspirational budget, it’s driven by a mission of what could be,” said board President Steve Zimmer. Zimmer called for the board to be more creative in seeking new revenues. “I think we spend so much of our time being responsive and responding to crisis, I really feel we’re not being proactive enough,” he said. Zimmer pointed to another potential financial crisis for the district: if an extension of Prop. 30, a temporary tax passed in 2012 that restored education funding that will sunset in 2018, is not passed by voters this November. He said the board needs an “all hands on deck” strategy to support the extension of the tax.